foto by Luca Babini and Gabriele Basilico. 1. INCOMPIUTO SICILIANO HAS BEEN THE KEY TO INTERPRETING PUBLIC-SECTOR ARCHITECTURE IN ITALY SINCE THE SECOND WORLD WAR. Its sheer scale, territorial extent and architectural oddness have made Incompiuto Siciliano essential to an understanding of Italy’s history over the last forty years. The smugness of many Sicilian town councils has generated an architectural style that conveys the many-faceted nature of the culture that fostered it. 2. UNFINISHED PROJECTS ARE THE RUINS OF MODERNITY, MONUMENTS BORN OF LAISSEZ-FAIRE CREATIVE ENTHUSIASM. In the years when positive economic sentiment and growth unexpectedly gave Italians financial peace of mind, imagination and exuberance were the driving forces behind a reconfiguration of the land. 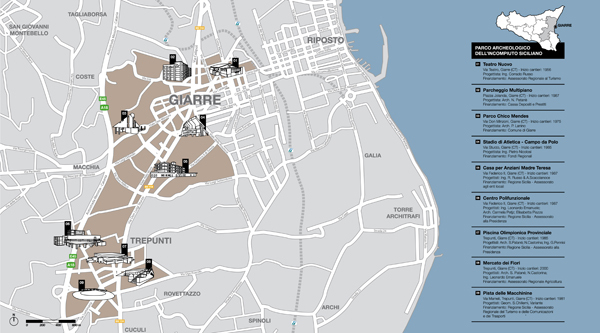 Landmarks in their own way, unfinished public buildings radiated out from Sicily to the rest of the peninsula, creating an Unfinished Italy. 3. 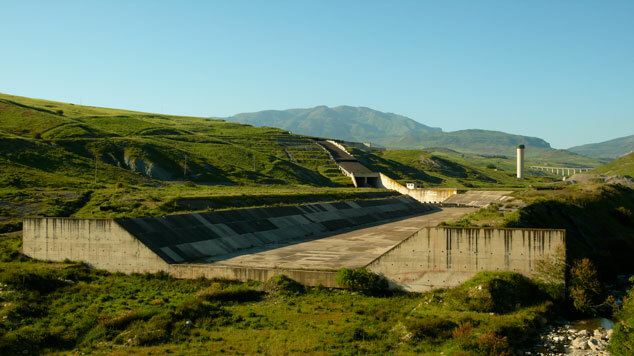 INCOMPIUTO SICILIANO DEVELOPED INTO AN INCISIVE, RADICALLY DIFFERENT ADDITION TO THE LANDSCAPE. THE PROCESS BY WHICH UNFINISHED PUBLIC BUILDINGS COME INTO BEING CELEBRATES CONTEMPORARY MAN’S CONQUEST OF THE LANDSCAPE. This conquest was determined, vital and unapologetic. The Incompiuto Siciliano did not harbour a rational, detached attitude, but its exact opposite. Only a passionate and deep relationship with one’s own land can generate such a varied and magnetic phenomenon. 4. 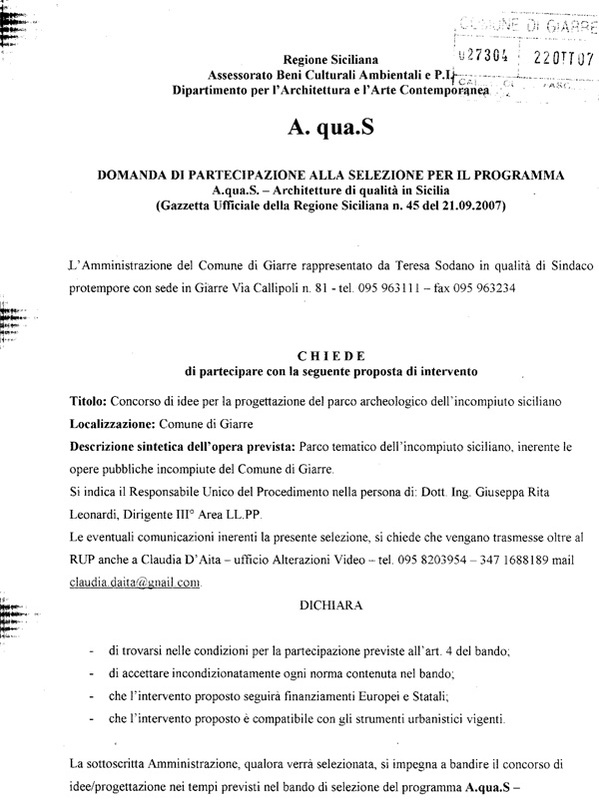 INCOMPIUTO SICILIANO IS POSTULATED ON THE PARTIAL EXECUTION OF A PROJECT FOLLOWED BY CONTINUAL MODIFICATIONS THAT GENERATE NEW SPURTS OF ACTIVITY. Incompiuto Siciliano is a temporal process. A dance repeated over the years with modifications and decisions that provide in-depth narrative of the speculative munificence of Sicilians and all other Italians. Seemingly purposeless sites dominate the landscape like triumphal arches. 5. NATURAL VEGETATION INTERACTS SYNAESTHETICALLY WITH INCOMPIUTO SICILIANO, RE-APPROPRIATING SITES AND REDEFINING THE LANDSCAPE. An exuberant community overrun by equally exuberant natural forces; these were the preconditions for the powerful bond between unfinished public buildings and the countryside around them. Figs, meadow grass, cacti, concrete, and iron: seemingly unrelated elements became the ingredients of a recognisable style and characterised its precise geographical and historical positioning. 6. 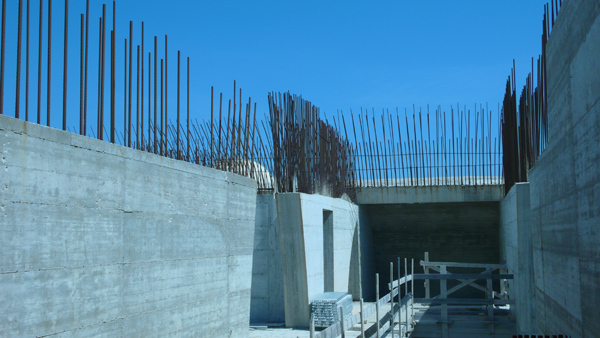 REINFORCED CONCRETE IS INCOMPIUTO SICILIANO’S CONSTITUENT MATERIAL. ITS COLOURS AND TEXTURES ARE DETERMINED BY THE AGEING AND WEATHERING OF MATERIALS. 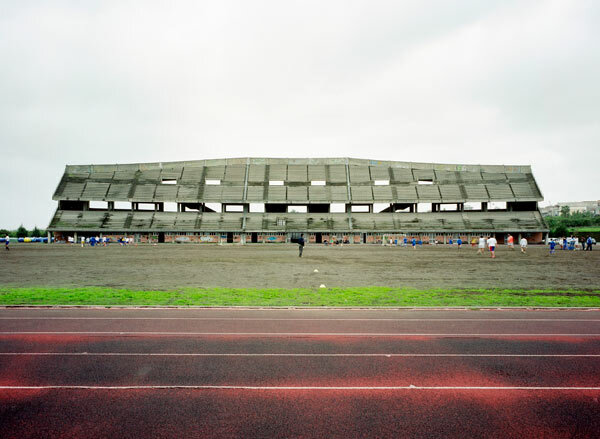 Concrete was pure matter, the bone structure of modernity, a symbol of work and productivity. It could assimilate the scars of time; take on new colours and shades. Using concrete was a powerful, meaningful step that made these places unique of their type. 7. 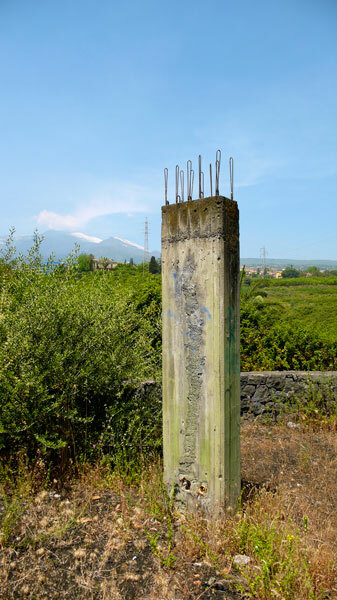 IN INCOMPIUTO SICILIANO THE CONFLICT BETWEEN FORM AND FUNCTION IS RESOLVED. LACK OF FUNCTION BECOMES A FORM OF ART. Sport is mental rather than physical effort, the product of a fervent imagination and a contemplative attitude. An attitude that resulted in public buildings which are devoid of any declared function but open to the imagination of the people who inhabited them. As places simultaneously representing art and official representation, unfinished public buildings brought forth and embodied the symptoms of contemporary society. 8. INCOMPIUTO SICILIANO MUSTERS AND REASSEMBLES METAPHYSICAL PLACES OF CONTEMPLATION, THOUGHT AND THE IMAGINARY. A land boasting a thousand-year philosophical tradition generates places for spiritual habitation and contemplation. These are places of existential awareness, embodiments of the human soul, and they are silhouetted against the horizon, testifying to our very nature as humans. 9. INCOMPIUTO SICILIANO HAS ITS OWN ETHICAL AND AESTHETIC FOUNDATION. In over four decades of existence, Incompiuto Siciliano marked the onset of something we need to observe very closely indeed. These forty and more years have scored and scarred our country’s soil and flesh, shaping its environments and communities. We need to lay bare these ethical and aesthetic foundations and come to terms with them. An ethics and aesthetics are the twin pillars of any style. 10. INCOMPIUTO SICILIANO IS A SYMBOL OF POLITICAL POWER AND ARTISTIC SENSIBILITY. Unfinished projects are not only the products of architectural talent, but also the nerve-ends of a complex and structured organism. Unfinished projects are born of the union of exuberant Sicilian creativity and the ancestral oratorical skill of these people. This skill has allowed the Sicilians to be conquered – by Greeks, Normans, Turks, Garibaldians – without ever submitting to their conquerors. Such talent is one of the constitutive elements of these sites and provides generous financial support for Sicily’s natural artistic urges. 1. INCOMPIUTO SICILIANO HAS BEEN THE KEY TO INTERPRETING PUBLIC-SECTOR ARCHITECTURE IN ITALY SINCE THE SECOND WORLD WAR. Its sheer scale, territorial extent and architectural oddness have made incompiuto Siciliano essential to an understanding of Italy's history over the last forty years. The smugness of many Sicilian town councils has generated an architectural style that conveys the many-faceted nature of the culture that fostered it. 2. UNFINISHED PROJECTS ARE THE RUINS OF MODERNITY, MONUMENTS BORN OF LAISSEZ-FAIRE CREATIVE ENTHUSIASM. In the years when positive economic sentiment and growth unexpectedly gave Italians financial peace of mind, imagination and exuberance were the driving forces behind a reconfiguration of the land. 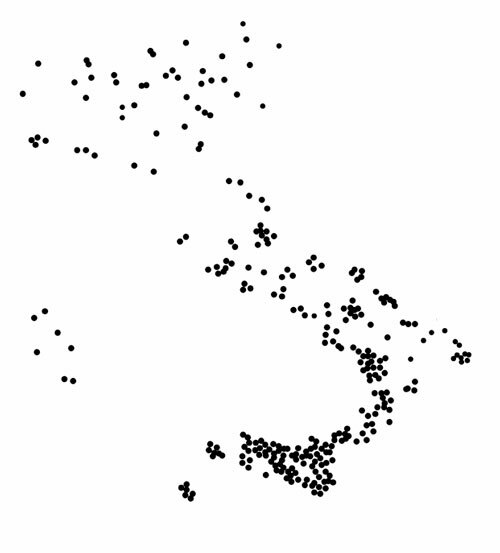 Landmarks in their own way, unfinished public building radiated out from Sicily to the rest of the peninsula, creating an Unfinished Italy. 3. 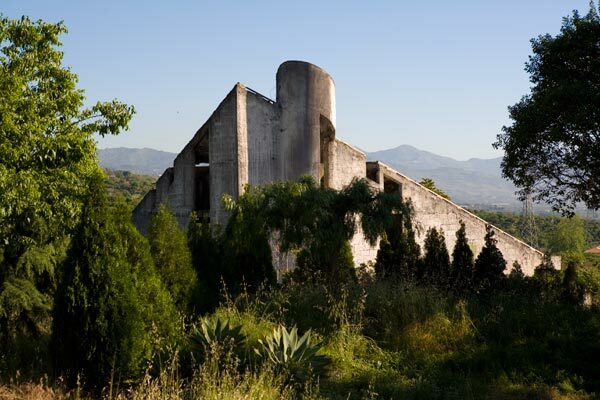 INCOMPIUTO SICLIANO DEVELOPED INTO AN INCISIVE, RADICALLY DIFFERENT ADDITION TO THE LANDSCAPE. THE PROCESS BY WHICH UNFINISHED PUBLIC BUILDINGS COME INTO BEING CELEBRATES CONTEMPORARY MAN'S CONQUEST OF THE LANDSCAPE. This conquest was determined, vital and unapologetic. Incompiuto Sicliano did not harbour a rational, detached attitude, but its exact opposite. Only a passionate and deep relationship with one's own land can generate such a varied and magnetic phenomenon. 4. INCOMPIUTO SICLIANO IS POSTULATED ON THE PARTIAL EXECUTION OF A PROJECT FOLLOWED BY CONTINUAL MODIFICATIONS THAT GENERATE NEW SPURTS OF ACTIVITY. 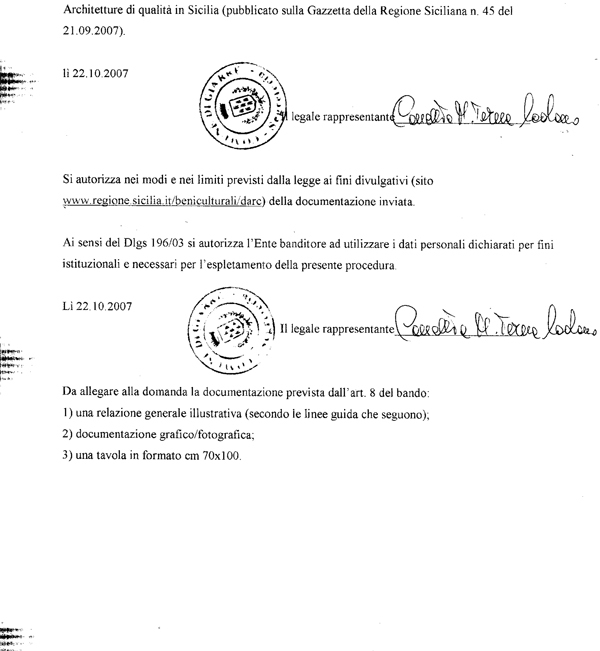 Incompiuto Siciliano is a temporal process. A dance repeated over the years with modifications and decisions that provide in-depth narrative of the speculative munificence of Sicilians and all other Italians. Seemingly purposeless sites dominate the landscape like triumphal arches. 5. NATURAL VEGETATION INTERACTS SYNAESTHETICALLY WITH INCOMPIUTO SICILIANO, RE-APPROPRIATING SITES AND REDEFINING THE LANDSCAPE. An exuberant community overrun by equally exuberant natural forces; these were the preconditions for the powerful bond between unfinished public buildings and the countryside around them. Figs, meadow grass, cacti, concrete, and iron: seemingly unrelated elements became the ingredients of a recognisable style and characterised its precise geographical and historical positioning. 6. 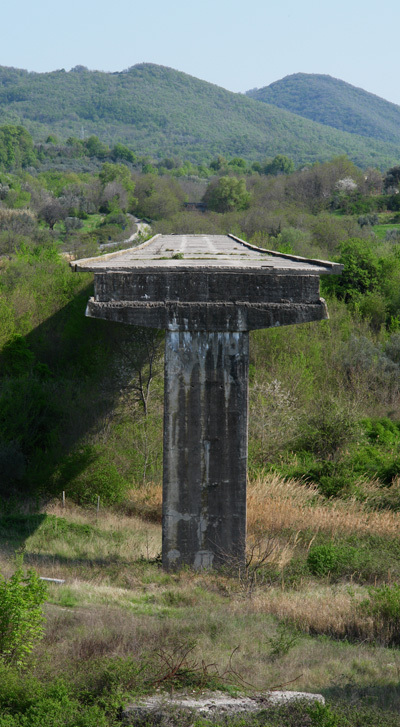 REINFORCED CONCRETE IS INCOMPIUTO SICILIANO'S CONSTITUENT MATERIAL. ITS COLOURS AND TEXTURES ARE DETERMINED BY THE AGEING AND WEATHERING OF MATERIALS. Concrete was pure matter, the bone structure of modernity, a symbol of work and productivity. It could assimilate the scars of time; take on new colours and shades. Using concrete was a powerful, meaningful step that made these places unique of their type. 7. IN INCOMPIUTO SICLIANO THE CONFLICT BETWEEN FORM AND FUNCTION IS RESOLVED. LACK OF FUNCTION BECOMES A FORM OF ART. Sport is mental rather than physical effort, the product of a fervent imagination and a contemplative attitude. An attitude that resulted in public buildings which are devoid of any declared function but open to the imagination of the people who inhabited them. 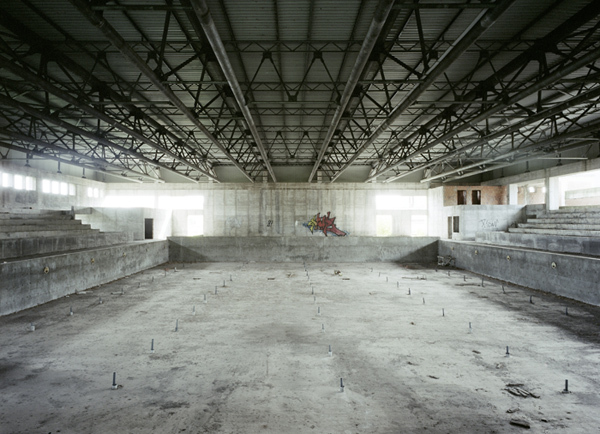 As places simultaneously representing art and official representation, unfinished public buildings brought forth and embodied the symptoms of contemporary society. 8. INCOMPIUTO SICILIANO MUSTERS AND REASSEMBLES METAPHYSICAL PLACES OF CONTEMPLATION, THOUGHT AND THE IMAGINARY. A land boasting a thousand-year philosophical tradition generates places for spiritual habitation and contemplation. These are places of existential awareness, embodiments of the human soul, and they are silhouetted against the horizon, testifying to our very nature as humans. 9. INCOMPIUTO SICILIANO HAS ITS OWN ETHICAL AND AESTHETIC FOUNDATION. In over four decades of existence, Incompiuto Sicliano marked the onset of something we need to observe very closely indeed. These forty and more years have scored and scarred our country's soil and flesh, shaping its environments and communities. We need to lay bare these ethical and aesthetic foundations and come to terms with them. An ethics and aesthetics are the twin pillars of any style. 10. INCOMPIUTO SICILIANO IS A SYMBOL OF POLITICAL POWER AND ARTISTIC SENSIBILITY. Unfinished projects are not only the products of architectural talent, but also the nerve-ends of a complex and structured organism. Unfinished projects are born of the union of exuberant Sicilian creativity and the ancestral oratorical skill of these people. This skill has allowed the Sicilians to be conquered - by Greeks, Normans, Turks, Garibaldians - without ever submitting to their conquerors. Such talent is one of the constitutive elements of these sites and provides generous financial support for Sicily's natural artistic urges.